If there's anything I'm a fanatic about, it's chocolate chip cookies. I tend to treat myself every now and then for an afternoon pick me up with coffee. There's just something about these cookies. Sometimes they have a hint of caramel flavor, sometimes it's butterscotch notes. I like them with nuts and even with out. They're great as traditional cookies or even as rectangle bars. I'll take them crispy, puffy, soft, hard, you name it. 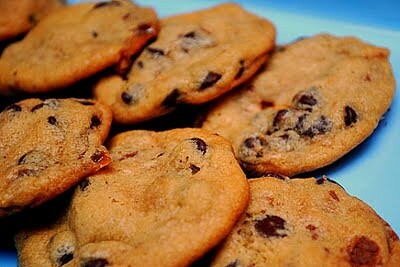 I can't get enough chocolate chip cookies! Then there's my friend Megan. She's a wise woman when it comes to cookies. The first time she made these for me, I craved them well after I polished them off (and it didn't take long.) I'm ashamed to admit that one time she sent me home with a plate of cookies and I ate them while I was driving around and running errands. By the time I got home, I didn't have anything left on the plate aside from crumbs. Horrible, I know. I don't think Megan realizes how awesome her cookies are. They're 'famous' within her friends and family, but to me, they are seriously one of my favorite cookies ever. Ever! So what's so special about them? For one, it's not just chocolate chips swirling around... it's better than that. Try chocolate chips and a chopped up Snickers candy bar. Envision that piece of Snickers tucked inside your favorite chocolate chip cookie dough. It's baked up and when you get these babies fresh out of the oven, the Snicker piece has melted a bit with some of the chocolate, caramel and nougat peeking through out of the dough. Heaven. Prepare your preferred chocolate chip cookie recipe. Prep your Snickers candy bar by cutting each regular sized candy bar into 6 even pieces. Take one piece of the Snickers candy bar and cover it with your prepared chocolate chip cookie dough to fully cover. Place cookies on an ungreased or parchment lined baking sheet and bake in the preheated oven for 9-10 minutes. Megan says its best that they are slightly under done so they remain chewy. Enjoy warm right out of the oven or before serving, heat in the microwave for 7-9 seconds to warm. * Although you can use mini sized Snickers, it's a bit easier to chop up one large bar than smaller ones... especially if you use a decent sized knife. These cookies look soooo good! 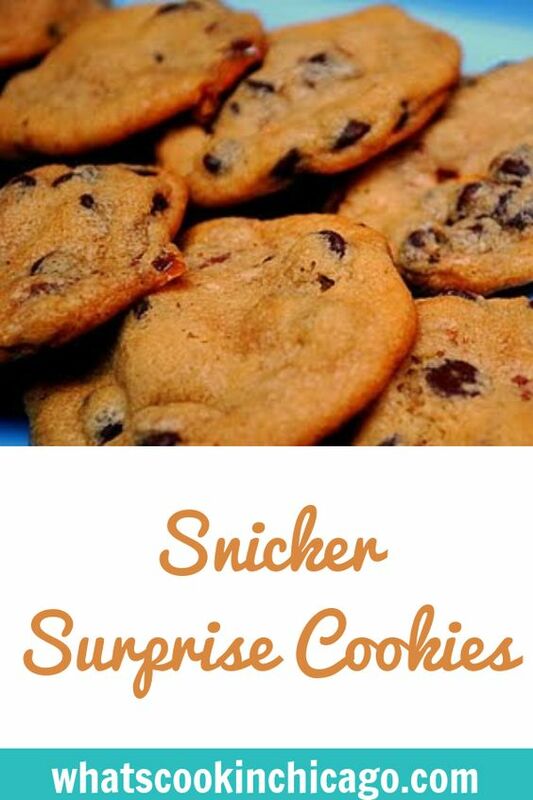 I might make them for my weekly treat for hubby's office next week! I am so making these later this week. I love Snickers and choc chip cookies. Yum! Yum! I'm adding these to my "to do" list. OMG this is a great idea! I love Snickers! YUM, and then you make ice cream sandwiches with these cookies. AWESOME! Yum! I think these are going to make an appearance at one of my football watching parties! I'm so glad I found this recipe. I was able to use up a lot of leftover Halloween candy. The uncooked dough balls also keep really well in the freezer. I only recently found your blog and I am digging it. There are lots of great recipes on here I'm anxious to try out. Thanks again!